Sardines are currency in this game and they are used in the black market or to converte to Bonus Points. How to get omega items? How to get sandbox mode? How to destroy the moon? 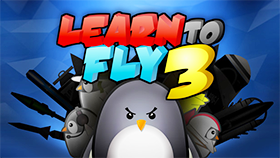 Learn to Fly 3 is an interesting arcade game that was created by Light Bringer Games and released on February 19, 2016 on Kongregate. This is the fourth installment in series Learn to Fly game and rated as the most interesting game in this series. It's also published a version on Steam and very well received. 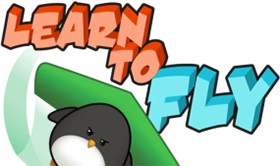 At the end of the game Learn to Fly 2, the penguin finally can fly. And in this installent, he received a new challenge. There is an email insulting him that he is only able to fly but he can't fly into space. After reading this mail, our penguin is extremely angry. He punches the monitor's screen and goes out of home to learn how to fly into space. He goes to the Penguin NASA building, does lots of lab experiments. And there is a professor comes up and tells him that he can help. The penguin rapidly exits the building and decides to do following the guide of the professor. With a great determination and an endless effort, after a series of upgrading equipment, finally, he can fly into space. There is a bit different in gameplay of this game from its previous games. It mainly focuses on a vertical, launch style game and consists of four game modes. Story mode: The final goal of this mode is to reach the space. This mode is a race to the moon at the altitude of 200k. However, there are several higher difficulty levels for you to conquer. For example, reach the moon at altitude of 500k, 1M, and 4M (M standing for millions in altitude). There are lots of medals in this game mode. They are four story mode medals, two Story Challenge medals, and 2 Speedrunner medals. Classic mode: You can unlock this mode after completing the story mode. Gameplay in this mode is similar to the original games. 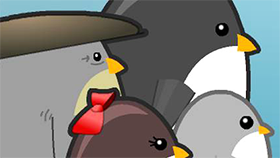 Players will have to control their penguin to fly to a certain distance. There are two medals for players in this mode. They are Classic Mode and Classic Challenge medals. To get Classic mode medal, players need to finish the game while getting the Classic Challenge, they must finish the game in under 11 days. Payload Mode: This mode only appears in this game and it is unlocked by completing the story mode for the first time. The main mission of players in this mode is to carry a given weight while flying into the space. Moreover, they must do it at the altitude of 200000'. There are also two medals in this mode. The first one is Payload mode medal that you can get when being able to carry 150 while flying. The rest one is Payload Challenge medal that you can get if can complete this mode in under 16 days. Sandbox Mode: This is also another game mode exclusive to this game. You can unlock it by clicking and holding title in the title screen or completing the Story mode at the altitude 200k in the first time. This is also the only legitimate mode that allows you to use the cheat codes to complete. These cheat codes will be mentioned in the "Tips, tricks, and cheats" section below. In addition, there is only one medal in this mode named Sandbox mode medal and you can get it by playing 20 days in this mode. Customization: In this game, players are allowed to customize all things related to HUD. In addition, players are also able to customize the bodies, hats, faces, etc of their penguin if having enough bonus points. Booster Packs: There are four different booster packs in this game. These packs can help players to improve their skills. They can get these packs by completing the story mode or purchasing with 30 sardines. Black Market: It is a shop in this game in which players can find and purchase lots of unorthodox but interesting items. Use arrow key to control the direction. Use the mouse to interact with items in this game. Playing the game in full-screen mode and turn the sound on will bring you the best experience. When you are able to upgrade, do it. There are some special medals in this game and they can grant you permanent bonuses. A special feature of this game is that in Sandbox mode, it allows players to use the cheats code. Below are some common codes for you. ThisIsAnAwesomeCode: Get all items that appear in game Learn to Fly 2.
ltf3mailinglistbonus: Unlock the Capt. Supporter body. To use these codes, you must enter them under Extras on the main menu screen. After that, let's redeem code to active them. We can't deny that Learn to Fly 3 is really a great game. It's even more excellent than its previous games. The fact that it received so many positive comments and feedback from gamers on Steam Community. This is the reason why there are lots of people want to play this game online at school or their workplace. However, they get some trouble with accessing because these areas block almost the gaming sites. If you are also one of them and looking for somewhere offer this game with unblocked version, you are in right place. On this site, we provide you with with full list of game in the series Lean to Fly for free, and all of them are unblocked games. This means you can access our site and enjoy your favorite game anytime and anywhere you want. With a simple and friendly interface, playing this game here will bring you a better experience. There are more than 10 million gamers playing games on our site per month. And it's our honor to welcome you to become our regular user. Now, don't waste your time, let's jump into the game and enjoy your relaxing time. In order to get sardines, you can use several different ways such as in booster packs, purchase with real money, or ... watch a video to earn. In detail, with Booster Packs, this is a very common way to get sardines. You can get from 25 to 50 sardine in booster packs depending on your lucky and ability. In addition, in the bottom right corner of the shop screen, there are some videos. When you watch them, you will earn sardines. Of course, the cooldown is set before another video can be watched and the number of sardines for the later videos is less. Day 2: Upgrade RC copters twice. Spend the rest on lvling box body. Day 3: Purchase an Aux Rocket boost and lv. RC copters; use an Earnifier. Day 4: Purchase launcher; Spend the rest sardines on RC copters. After that, use leftover on Aux. Rocket. Day 5: Purchase the Hero Costume and sell the Aux. Rocket and RC Copters. Use all of the rest money to purchase lvling explosives. Use the Earnifier. Day 6: Upgrade your explosives to at least Lv.7; Upgrade the Hero Costume; Use Speedifier. There are six omega items in this game and you can get them by finding fragments of their cards in booster pack. And you can get the booster packs by completing games or purchasing them in the black market. In addition, if you have lots of regular item cards, you also have chances to get omega items. In order to get sandbox mode, you must click and hold title in the title screen. In addition, you also can get this mode by completing the Story mode 200k at the first time. Step 1: Get the El Fuego and upgrade it to the maximum level. Step 2: Purchase the sonic burst stage and continue upgrading it to the maximum level. Step 3: Get a powerful launcher and start your journey to break the moon.